Thanks also for such a quick easy sale! I would like to take this opportunity to thank you for your great service, patience and advice and I wish you all the best in your future real-estate projects. Thank you for the hard work you have done in helping us find our dream home and also selling our previous home. Your patience with us was amazing. I must admit that we both had high expectations in what our dream home would look like and it was worth waiting for, even though it took over a year to find it. Your ability to make time for us whenever we called or wanted to see a home in a hurry was appreciated. Your knowledge on issues that arise with any home and pointing out those potential problems or areas for improvement allowed us to feel confident about or choices in accepting a home or not. Your attention to the detail in how to sell a home was helpful for us to prepare our home for sale. And what a great success that we sold it on the first night of showing! The BEST thing about you was that even after we moved into our new home and a problem arose with an unpaid bill from the previous owners, your assistance in solving the matter saved us close to $300.00!! Thank you doesn’t seem enough to say! We felt you were a highly motivated agent that was never aggressive and as time went on in our search for the prefect home, we grew to respect your opinion and trusted you implicitly. We would definitely recommend you to any of our family or friends if they needed to buy or sell a home. 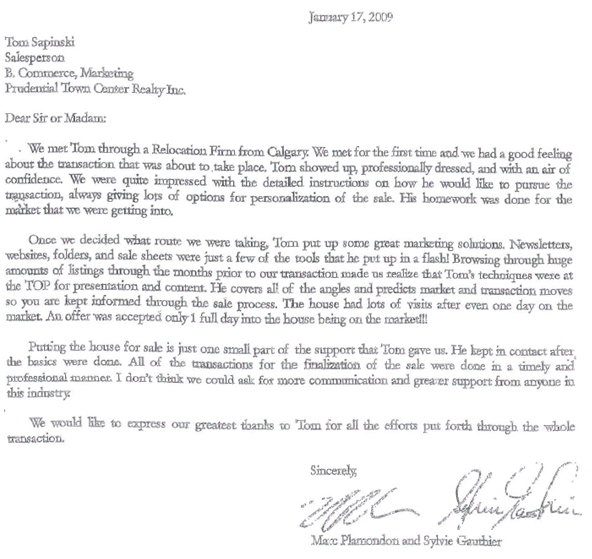 Tom was referred to us through a friend, and we were very pleased with his service in selling our home. He provided a good combination of relevant research, effective staging and marketing recommendations, a pleasant and professional manner, and honest hard work. We received two offers the first day of showings, one of which resulted in the sale of our home above asking price. We would definitely recommend him to anyone thinking of selling their home. I wanted to take this opportunity to write a testimonial for you to use. Working with Tom was a pleasure. His business savvy was crucial in the successful selling of our home in a timely manner, as well as maximizing its selling price. He was very prompt in returning phone calls and emails. His communication style was very clear and concise. 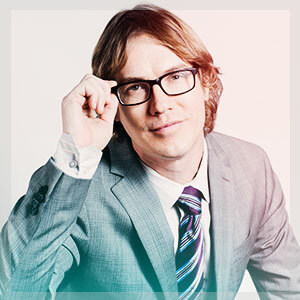 He impressed us the most with his multi-pronged approach to marketing. Thank you so much for taking care of the purchase of my condo and sale of my home. You were wonderful and caring and available all the time. The home sold very fast and we couldn’t believe it. We will be sure to use you in the future! Tom was very helpful during the sale of my condo in Ottawa as well as during the purchase of my house in L’Orignal. He knows the Eastern Ontario area very well and is always ready to share information pertaining to real estate. Tom is always polite and respectful and is very thorough in his work, doing his research and checking every detail. He always returned my calls promptly and addressed all the issues that arose, during and even after the sale. I found Tom very helpful and reliable, and very trustworthy. I will certainly call on Tom again for my next real estate transaction. I’ve had the pleasure of working with Tom on two separated occasions. First time as a first time home buyer and the second has a first time home seller. Needless to say I had zero to little experience in the real estate realm. It was important for me to find an agent in which I could trust not to take advantage of my inexperience and have my best interest at heart. Well I’m here to tell you Tom is that person. He guided me through every step of the process while making me feel at ease the whole time. Tom always made himself available to me at any time anything was needed. One of my favorite things about working with him is that I never felt pressure. We were always working at my pace. The last thing I want to mention is that his knowledge is an indispensable asset. There were a couple of occasions where the situation got tricky and could have gone bad quickly. Lucky for us he made the right decisions every step that got us the sale price we wanted. At this point I do not consider him just my agent but also my friend. He truly is a genuinely good person. Thank you so much Tom for all the hard work you put in for us. We now have the home we’ve always wanted and I will forever be grateful. Do not estate to call this man if you’d like real estate advice. You’ll see for yourself. Thank you very much for coming over today and helping us with the fireplace. Thank you as well for the lovely bottle of wine which we are keeping to drink when we are finally settled and can enjoy it and thank you as well for the lovely comments on your card. It’s been a pleasure dealing with you throughout this process and the world would be a better place if it was filled with more people like yourself.